Sensitive data (e.g., passwords, health data and private videos) can be leaked due to many reasons, including (1) the misuse of legitimate operating system (OS) functions such as core dump, swap and hibernation, and (2) physical attacks to the DRAM chip such as cold-boot attacks and DMA attacks. While existing software-based memory encryption is effective in defeating physical attacks, none of them can prevent a legitimate OS function from accidentally leaking sensitive data in the memory. 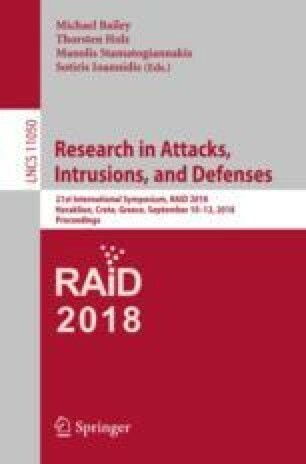 This paper introduces CryptMe that integrates memory encryption and ARM TrustZone-based memory access controls to protect sensitive data against both attacks. CryptMe essentially extends the Linux kernel with the ability to accommodate the execution of unmodified programs in an isolated execution domain (to defeat OS function misuse), and at the same time transparently encrypt sensitive data appeared in the DRAM chip (to defeat physical attacks). We have conducted extensive experiments on our prototype implementation. The evaluation results show the efficiency and added security of our design. We thank the anonymous reviewers for their valuable comments. This work was supported by NSF CNS-1422594, NSF CNS-1505664, NSF SBE-1422215, and ARO W911NF-13-1-0421 (MURI). Neng Gao and Ji Xiang were partially supported by NSFC (No. U163620068). Jingqiang Lin was partially supported by NSFC (No. 61772518).